Everyone makes a choice to follow someone, something or some idea – even if one were to say they do none of these, then they would have to be following “self”. Some people are leaders, others are for the most part followers, but even given that, each person does both leading and following in one form or another. The level at which we do both of those will greatly depend on Who is leading us – which brings me to a hymn which this Series is based: He Leadeth Me written by Joseph H. Gilmore in 1862. It is indeed a profound statement – for each of us are “would be” followers because none of us are perfect, sinless and in Heaven – if we are reading this, so to speak. It is all a matter of Faith – which is what encompasses this Series by each part fitting together like the pieces of a puzzle. This Series has been on the thought provoking list for months now and a person came to mind who likes daisies more than any other person I know – they will know who they are. (hope you like them). 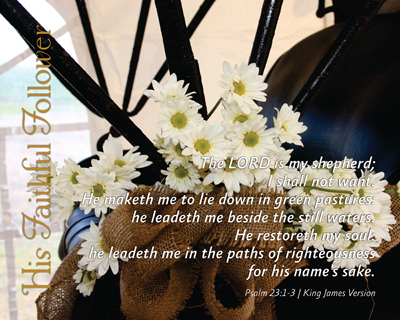 Psalm 23 provided to be the Guidance chapter of Scripture that was needed for the Hymn He Leadeth Me so a Bible study could be built around it. Then and only then would the concept and words come together for the Series itself, for it was three words that were being seen together as a statement, instead of separated to create something indeed special: His — Faithful — Follower. It took careful searching and discovery through nearly 1,300 verses of Scripture to develop the SO simple pieces which humbled me more as they fit together so tightly. In order to for the Christian to be counted a Follower, they must be Faithful – notice, not perfect, and to be counted Faithful, we simply MUST be His. We are provided the tools, instructions and strength as His Children when we accept Christ as our Saviour. He is BY FAR more Faithful toward us than we could EVER be to Him, but He knew that already. He went to Calvary for each of us before we were born into this world. There are total of eighteen (18) prints in this Series, which comprise a Series as serious as any other that has been developed – we have a choice to make, not only for our one day Home in Heaven, but each and every day that we decide to serve Him. As Christians, do we understand that we have been bought with a GREAT price? It is SUCH a great price that no man could EVER hope or scheme to come close to matching. Can we, will we, determine at this very moment that we will be His Faithful Follower, realizing that simply is all that He is asking of us to do in seeking His Will for our lives? We should live with purpose, no questions or qualms about that, but our lives are indeed comprised of moments in and of time, right now is what I’m talking about. How then will we proceed to submit to Him? We will only do His Good Pleasure if we submit willingly to the guidance, command and urging of the Holy Spirit, by actively imitating His Example. Oh, how we need to be His Faithful Followers in this day, time and place where such revile is had for the things of God. Imagine with me for the next little bit, having the ability to speak words so powerful to cause death or to bring life to a person who is dead. Where would you go and who would you speak to directly to gain whichever desired aspect for each person you can think it could be a benefit unto you? Have someone in mind? Now, let’s switch gears on this imagining to either your or my standing beside One who can actually do this in Real Time – Jesus Christ. As a Christian, would you now have that same thought and desired end? Would you and I have our Lord and Saviour repeat those EXACT same words, hoping to gain the EXACT same death or life event? As temples of the Holy Spirit, we DO have Him with us – AND He HEARD the WORDS the very FIRST time we thought/said them. Sobering thought and truth. Just as the Lord promised Martha that He would raise her brother and Jesus’ friend, Lazarus did indeed rise and live after He spoke specifically to him. Given that many have not never seen the Lord with our own eyes, He sees into every facet of our lives, beings, worship, work and gratitude. There are ten (10) words drawn from the Scriptures to build a more concise picture of understanding that in the last day, when King Jesus Returns, all that believeth in him will rise to meet Him in the air. This Series actually started out as a witnessing opportunity for an individual who crossed my path where they didn’t want to discuss “religion” because they didn’t believe God cared anything about them. They were amazed that I would be out doing things because of the noticed difficulty that was witnessed in my getting up and down to photograph at the WRAL Gardens. In my doing so, just shared that it was God’s Creation which was being photographed, His Grace that allowed me to do so and His Provision to have the ability/gift to do so. Yet even then, they wanted to see the results of my work before any further talk would be considered. Obliged in getting an e-mail address to send photos and prints – providing what they asked for an proof of my dependence on my Saviour. What about YOU Christian? Are your actions speaking louder than words and what you speak matching what is being seen? I may never get to meet or communicate with this individual again, but want to be faithful in word, deed, action – doing so with every opportunity that is given. We MUST be about showing others what our Lord and Saviour means to us, otherwise they will have no reason to Believe anything we say to them. It is amazing, to me at least, how when we as Christians take the time to study God’s Word with a specific thought or idea in mind, can have it changed by the Holy Spirit. It began with a simple list which had crossed my radar a while back about “God as Revealed in Daniel” was given a focus in taking a look at just one single book of the Bible, Daniel – in the Old Testament. Is it, or would it be, possible to take any book of the sixty-six (66) that make up the Bible, God’s Holy Word – to provide a Revealing of God? To answer this question, we need to get a definition of a couple of words: defining and revealing. There are those who might think that what is being referred to is something new or a revelation – that is NOT what is being explained here. Once we understand that we are seeking the LORD and what His Will is for our lives through the reading and studying of the Bible, the purpose of this Series will EXPLODE like fireworks, giving a manner of looking at our lives to see how Wonderful He has been to us-ward. Digging through what was already known provided me something astounding, in a wrong manner, the material which the basis/premise was being developed from, had glaring mistakes included. For a short time, focusing on that detail caused me to question the validity of the process, so much so that I put my pen down to clear my mind of the clutter that was building up around the mistakes. It was then that the realization that two words were missing, not overlooked, but completely missing – the first and last words of the now finished Series: de•fin•ing and re•veal•ed. As defined above/previous to this section, we should be seeking the LORD in, about and around everything we do as Christians – how will we Know Him if we don’t speak and listen to Him? In each passage/book considered in the Bible – the words of this Series should lend themselves to discovering what that writer/writers which penned the Book under inspiration of God was instructed to share. We MUST be faithful to keep ourselves in the Book, submersed in it, willing to be changed by it. The Holy Spirit will make known what the LORD has in store with each passage, even using the same passage over and over again for related or unrelated lessons learned. One of the most important of those lessons is the factor that He is ALIVE! We should be able to see His living, giving life or securing life in every passage we read, ponder, study and take in as our own. 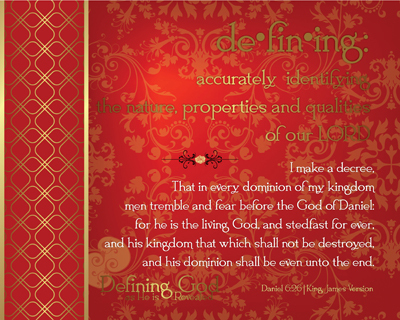 This Series not only defines the words, but makes application of them through verses of Scripture through and in the life of Daniel. Each of the eleven (11) words have specific events, times and happenings where we can see His Provision and Declaration made in real peoples lives. We need to be reminded that the Bible is full of REAL people, living REAL lives, getting into REAL messes and making the choice to Trust the LORD in REAL Life. The following thirteen (13) words are utilized in this Series a provided in syllable format, broken down into word parts for us to be reminded that we work in parts too. When we correctly define the words and make much over Who He is – He is Faithful to Reveal to us what we are to be doing for Him, as He provides in abundant supply the tools needed to do so. For this Series, we have the incredible opportunity to see how God works through the lives of people in the Book of Daniel from the Old Testament in the Bible. In just one Book of the Bible the LORD puts before us a consideration of an thirteen (13) layer sandwich, comprised of two pieces of proverbial bread [Defining and Revealed] and the remaining eleven (11) pieces of proverbial meat [from awesome to wise]. Now that I think about it, it is a Spiritual Manna for Believers today, which we should have consumption of regularly. As Easter has just occurred in the past few days of this Series being finalized, “liv•ing” is an ALL important Defining to be Revealed which we should share with everyone we meet – saved people need the Encouragement and unsaved folks need to SEE it in action. We serve a RISEN Saviour, God is NOT dead – He is a-liv•ing!!! It is one thing for someone “to say they will be with you”, but an entirely different thing indeed when God says so. This Series is a set of discoveries and instructions which after much study, I believe will apply to the new Christian, as well as the more seasoned and mature Christians. It does for me, like a perfectly placed puzzle. When the going gets rough, more often than not, in my experience and watching what people do during these times, the worldly individual will hang on for a little while, but as the potholes and speed bumps in life get more severe, they bale. In doing so, they leave those they once supported high and dry. For sure when there is more risk involved, the cachet of “friends” and “acquaintances” will grow mighty slim. As my Grandpa Turner used to say, “them sure are slim pickn’s you got there boy”. No matter where we find ourselves, ever more God is with us in a way and manner that the unsaved world could only begin to imagine, by the way of the Holy Spirit. Each of these verses (passages on final) of Scripture is not only an Instruction, but it is also a Promise – He will be with us. 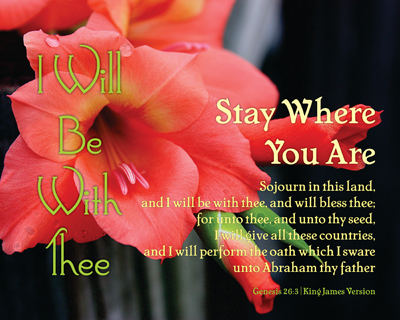 When you know you are where the Lord wants you to be, but are unsure of what to do – STAY where you are. If you know that you’ve gotten off on the wrong path – RETURN to your right place (Home Land) to be. In this un-surety, when you get to where you are supposed to be, He will give you the Confidence by way of the Holy Spirit (He Will be in you). As you follow Him, Be Strong and of Good Courage – He is in Control and Provides all substance for you and for me. We may have told a friend this phrase, “I’ve got your back”, God says that same thing in the following manner, “Your Boundaries are Guarded”, as He will Protect us as we follow His Will for our lives. While others may not see the path we have chosen and give any credence to it, “God will Honor You” for doing so. We must remember that each of us have a calling on our lives to do, be, go, perform a duty for Him, “Your Commission is Holy”. This next one is something I’ve got some experience, in this category of thought and action… Simply “Listen and Do What is Asked of You”. God will put in places where one has to push well beyond themselves, so we have no choice but to lean, trust, believe Him for the Enablement. While the impossible becomes reality, we also need to remember that the “Provision of Protection is Yours.” We will be enabled to do all that will be asked of us to do, go to… We need to “Keep That Which is Committed” to Him. Keep the Faith. Grace be with thee. Just as it was in the Bible with Timothy! Every Promise in the Book is True, for me and for you. Each of these Series prints builds into a pathway of Encouragement and Direction from God’s Word. They also stand individually in a single sense as a Promise and Direction. Each of us have had a time or two that we didn’t know quite what to do given this or that circumstance. As any individual that has been a Christian any length of time will tell you, where there is a smooth spot, not all may be as it seems. Job didn’t know what in Creation was befalling him and needed to have the reassurance that God was still on His Throne – we are no different. We may not understand why things get veered here and there, a pothole comes out of what appears to be no-where and the most dreaded of them all – the perfect storm being brewed under COMPLETE stillness, quiet and calm. Consider the pieces of this Series to see which of them have application to where you are right now – you may find, as I have, each one of them filled a place where the Word was needed – remember, these pieces are God’s Word – just placed in an order to remind, Encourage and challenge. Here we are – right in the middle of one of the times of year when folks will go to church. Dressing up for Easter is a Yearly tradition, for Christians and non-Christians alike. My question is this though, do we really know why we celebrate Easter as Christians? Am not talking about a history lesson here, although His-Story is what History can be seen as, because it does tell His story, even when others try SO hard to keep it from doing so… What is being referred to here is about what happened on Easter Sunday – what changed, who was changed, where were they changed, when did this change occur and how did it happen. One person was the catalyst for all of those questions – the Lovely Lord Jesus Christ, the Son of God, the Saviour of the World. A festival of the christian church observed in commemoration of our Savior’s resurrection. His birth set the stage for Redemption, His death changed everything forever but His Resurrection gained us the most precious reward for all time – Salvation as the result of Redemption. As the preparation was made for this Series, something was noticed – the passages of Scripture form a story, each of them preparing the blocks building up to nothing less than Salvation. It is a witnessing story, centered around the VERY reason we have Redemption, Salvation and an Inheritance! This story is given to us in pieces, sharing God’s Love through the ULTIMATE sacrifice, for each person to decide for or against. 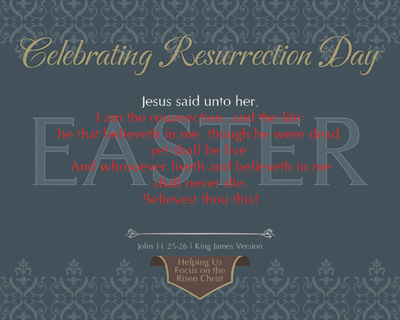 Easter is a Celebration – of the very REASON we can Celebrate Our Salvation in Him. It is my sincere and humble hope that each person who runs across this Encouragement Series will take the time to read through the site, making much through their own celebration of the King of Glory and Ages. How we celebrate will vary, just as persons, families, neighborhoods, cultures do things differently. Indeed we need to Lift Him Up and Celebrate the VERY day that we might consider our Salvation and life. 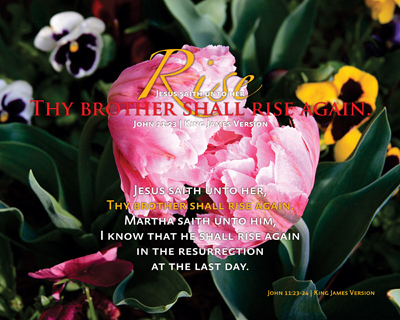 There are ten (10) individual prints created with the passages as they will excite the the mind and soul to helping others know the Risen Saviour! People ask me here and there, “Why are you so happy all the time?” Wrong words to say to me – a song immediately comes to mind and my “hummer” gets a bit Karaoke at times – Glory, Glory!!! It really is because of having “Hope in Residence” within me. Easter seems to bring out the “prettiest and most concern for people. As Christians though, we are supposed to CELEBRATE every day as if it were Easter – it is one of those things that makes me happy. But, that is not all, it is staying close to Him, listening to Him and hearing from Him. Even in dark, tough, challenging times – what is inside will naturally come out. If you have the Holy Spirit within you, some way, some how, in some manner He will reveal Himself to a person and those around them will notice the change and know it has to be ofSomeone greater than themselves. As we talk to others about Easter, let us be willing and eager to share our testimony, showing them the Celebrating of the Resurrection of the Lord, which will turn our focus on Him, helping us Focus on the Risen Saviour, Jesus Christ.